When working with our customers, sometimes it can be hard to show them what quilting designs would work best on their quilt. We, as professionals, who work with the quilting designs on an almost daily basis, can “see” what will work best on a quilt. Our customers, who don’t “see” the designs like we do, can sometimes have problems visualizing what we are talking about. To visually show my customers (and myself) the quilting designs, I recommend using a sheet of plexiglas, with duct tape (or other colored tape) around the cut, outside edges. 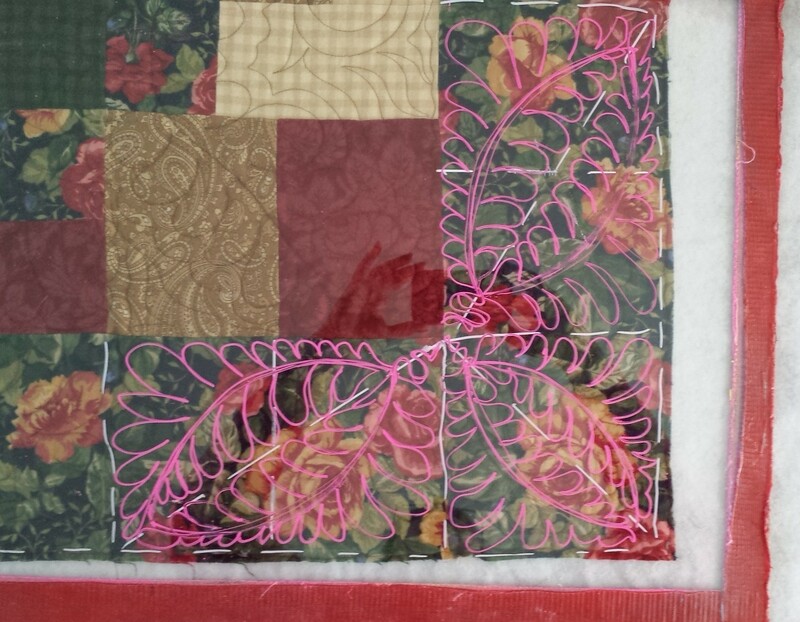 Place the plexiglas on top of the quilt, then use a Vis-a-Vis marker to draw the quilting design, full size, on the quilt top. Both you and your customer will then be able to “see” exactly what will be quilted. Lately, after drawing out the design for my customer, I will take a photo of the drawing – while the plexiglas is still on the quilt top – with my smart phone. I can refer back to the photo or print it out and keep it with my paperwork for this quilt. There are some limitations on using the Vis-a-Vis markers. These markers show up very well on light fabrics, but are almost impossible to see on dark fabrics. I was browsing around in the office supply store yesterday (Office Depot) and found a set of “new” marker that works very, very well on plexiglass. 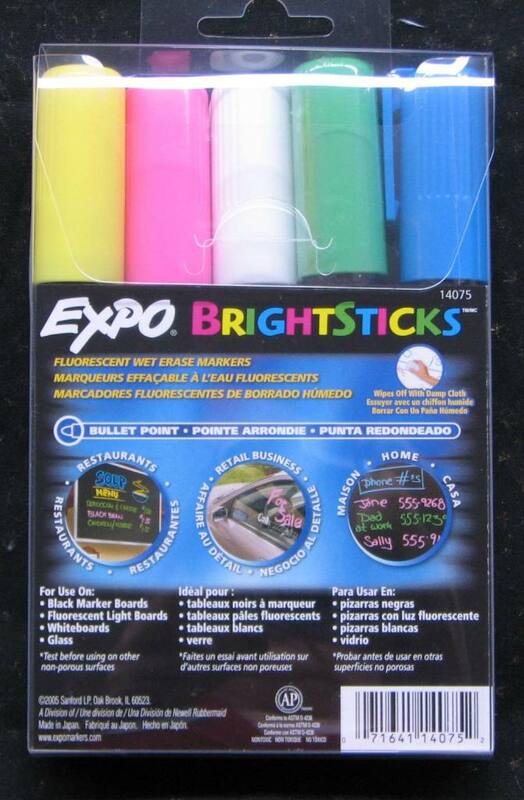 The markers are called “Expo Bright Sticks” made by the Sanford company. Click on photo for a larger view. This package of markers was a little pricey, about $23 for the package, but, well worth it! I took the markers home, put some dark fabric on top of a quilt, put the plexiglas on top of the dark fabric, and began drawing. Oh my! What a difference! The colors of the markers really “popped” and you could see all my drawings. Here is a photo of one of my sample drawings. Click on the photo for a larger view. Best of all, the drawings “erase” with a damp paper towel. Note: the red on the photo above is the duct tape along the cut edges of the plexiglas. I wish I had these markers last week. I received in a customer quilt that was pieced with a lot of dark brown fabrics and drew my quilting lines with the black Vis-a-Vis marker. Both my customer and me were having a hard times seeing what I was drawing! Anything that helps us communicate with our customers – especially the quilting designs – is always welcomed. I give the Expo Bright Stick markers a big “Way to Go!” and WILL be using them, a lot! 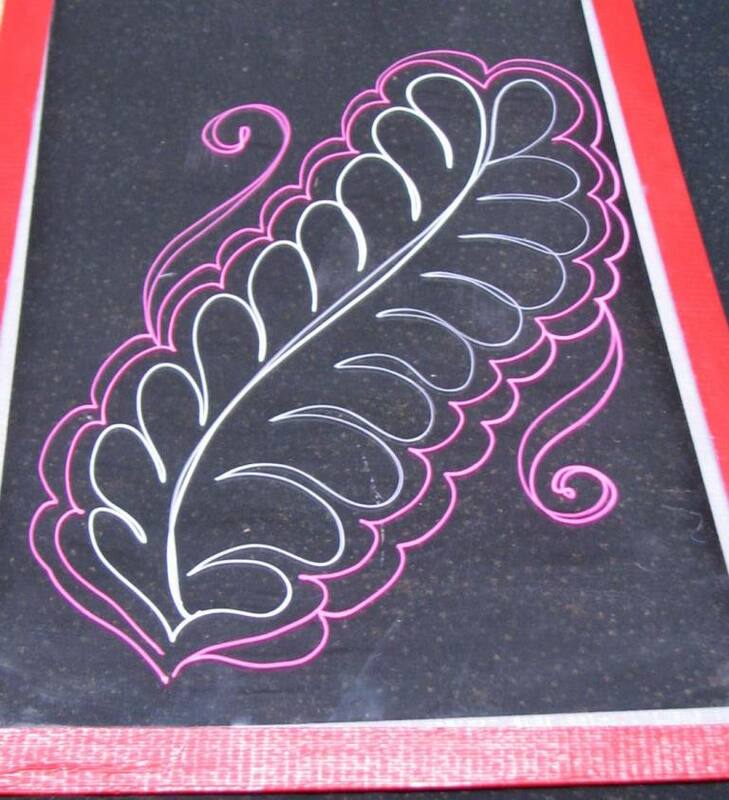 If you have a way to show your customers the quilting designs, please let us know by posting a comment. I started this blog to talk about issues, problems and the joys of having a machine quilting business. I have tried to post on a fairly regular basis, but, the last few weeks have been a challenge. I don’t like talking too much about myself, but I would like to tell you what has been going on in my life lately. For the past few years I have had bad arthritis in my hips. No one can say for sure how I got the arthritis (no one in my family has had arthritis like this in the past.) Before beginning my machine quilting career, I drove a school bus for nearly 20 years and had many, many years of individual endurance sports (power walking, marathons, triathlons and long distance biking.) With all that wear and tear on the hip joints, something had to give! The pain in my right hip was awful and finally, 8 weeks ago, I had hip replacement surgery. I am SO thankful for modern medical science and the wonderful Doctors and hospitals that make this type of surgery possible. The good news is that my surgery was a huge success and my right hip is now pain-free and I am almost back to all my normal activities. For nearly six weeks after my surgery I sayed with my daughter and her family and they took excellent care of me. I am so blessed to have wonderful children who have helped me during this time. Most importantly, I am able to stand and quilt without pain! I have already quilted some quilts for American Hero Quilts (they make quilts for wounded service members – To view their blog Click Here) and I am starting on some new quilting projects of my own. After my surgery, I realized how much chronic pain I was in due to my arthritis. Now that the arthritis pain is gone, I been working on some new templates, new pantograph patterns, a new video class and other quilting related projects. There is so much to be done and I am loving every bit of doing it!